Background & objectives: Malaria is considered as the most important parasitic disease of humans, causing serious illness that can be fatal, if not diagnosed and treated immediately. It is a multisystem disorder affecting nearly every system of the body. The aim of the present study was to evaluate the involvement of cardiovascular system in severe malaria using non-invasive methods. Methods: This prospective study was conducted on patients of severe malaria who were admitted between June and November 2015 in the Department of Medicine, Rajendra Institute of Medical Sciences and Hospital, Ranchi, Jharkhand, India. A total of 27 cases (18 males and 9 females; age ranging between 15 and 70 yr) of severe malaria (P. falciparum 24; P. vivax 1; mixed 2) were diagnosed by microscopic examination of peripheral blood smear and bivalent rapid diagnostic test (RDT) kit. The assessment of cardiovascular system was done by clinical examination, chest X-ray, ECG and transthoracic echocardiography. Results: In all, 7 (26%) patients were found to be suffering from circulatory failure, out of which one was P. vivax case and rest were cases of P. falciparum infection with high parasite density. One patient died due to cardiovascular collapse. ECG revealed sinus bradycardia [Heart rate (HR): 40–60] in 7% of the cases, extreme tachycardia (HR: 120–150) in 3.7% of cases and premature arterial ectopic with tachycardia in 3.7% of patients (p <0.05). The echocardiography findings were global hypokinesia with decreased left ventricular ejection fraction (<55%) in 11.1%, grade 1 left ventricular diastolic dysfunction in 3.7%, mild tricuspid regurgitation (TR) with mild pulmonary artery hypertension (PAH) in 3.7% and mild pericardial effusion in 3.7% of the cases. The ECG and echocardiography changes indicated myocardial involvement in severe malaria. Interpretation & conclusion: The present study indicated involvement of cardiovascular system in severe malaria as evidenced from ECG and echocardiography. The study also revealed that cardiovascular instabilities are common in falciparum malaria, but can also be observed in vivax malaria. Malaria is a leading public health problem in Jharkh and state of India. It is situated in the eastern part of India and surrounded by the states of Chhattisgarh in the west, Bihar in the north, West Bengal in the east, and Odisha in the south. The total population is 32,988,134 (census 2011) with 28% of inhabitants being scheduled tribe (ethnic minority tribes). It is predominantly a rural state with 80% of the population living in rural settlements. Roughly 30% of the land area is forested. Ambient temperature ranges between a maximum of 48°C and a minimum of 5°C, while humidity ranges between 28 and 80%. Average rainfall is 1292 mm per year. The Jharkhand state is highly endemic for malaria, contributing about 7% of total malaria cases in the country. It has relatively stable malaria transmission with a yearly average slide positivity rate (determined from both passive and active surveillance) of 15% for the last three years. Plasmodium falciparum accounts for 44% of the cases while P. vivax accounts for 56%. Four species of malaria parasites infecting humans, viz. P. falciparum, P. malariae, P. ovale, and P. vivax are present in Jharkhand state,. Plasmodium falciparum is the highly virulent species. Malaria mostly affects children under the age of 5 yr and pregnant women, in developing countries. Pregnant women are more vulnerable because they experience depressed immunity during pregnancy, endangering the lives of both mother and the child. A similar problem arises with children below the age of five, as their immunity systems are not yet fully developed. A review of literature revealed, malaria may be complicated by cardiac involvement. In analogy to cerebral malaria, cardiac involvement is mostly limited to acute infections with P.falciparum. The aim of the present study was to assess the cardiac involvement of malaria in patients using non-invasive methods. Therefore, a hospital based prospective observational study was conducted to describe the clinical profile, laboratory abnormalities, complications and outcome of P. falciparum malaria in the endemic tribal population in Jharkhand state, India. A prospective study was conducted on patients suffering from severe malaria without a previous history of cardiac disease who were admitted during the period of June to November 2015, in the Department of Medicine, Rajendra Institute of Medical Sciences (RIMS) and Hospital, Ranchi, Jharkhand. This hospital is a tertiary care hospital in Jharkhand. The hospital receives patients from all over Jharkhand and from adjacent districts of nearby states. Adult patients, presenting with an acute febrile illness to the emergency ward and/or with sign and symptoms of severe malaria in the medicine outpatient/inpatient department were included in the study. A written informed consent was obtained from all the patients included in the study. In case of an obtunded patient and children the consent was obtained from the nearest relative. Ethical approval: Ethical clearance for the study was obtained from the Institutional Ethics Committee, Rajendra Institute of Medical Sciences and Hospitals, Ranchi. The clinical diagnosis of severe malaria was based on WHO guidelines and confirmed using a rapid diagnostic test (RDT) kit (SD Bioline Malaria Ag Pf/HRP-2/Pldh, 3 band kit, India). RDT positive cases were examined by thick and thin blood smears from finger prick blood samples. Slides were examined by trained microscopists under compound microscope at 100x magnification after staining with Jaswant Singh Bhattacharjee (JSB) stain (Rankem, India). Asexual forms of the parasite were counted against 200 leucocytes and parasite density was calculated as number of asexual parasites per μl of blood, assuming a mean normal leucocyte count of 800 μl. All patients were evaluated clinically by non-invasive methods including ECG and echocardiography within first three days of diagnosis, followed up on regular basis and discharged after improvement of clinical symptoms. Assessment for cardiovascular involvement was done by (a) clinical examination and chest X-ray. Chest X-ray was done to assess any evidence of cardiomegaly and lung field congestion; (b) ECG (12 lead) in which following points were analyzed—Heart rate, rhythm, PR interval, QRS interval, QT/QTc interval, P waves, QRS voltages, ST segments, T and U waves. A complete echocardiographic examination was performed using standard technique. Parasternal long and short axis and apical two and four chambers views were obtained for all the patients. Complete blood count including TLC, DLC, Hb, ESR, PCV, PLT count, blood glucose level, serum urea, serum creatinine, serum bilirubin and SGOT/SGPT tests were performed for all the patients. Lumbar puncture and CSF analysis were performed in all the suspected cases to rule out meningitis and encephalitis. Dengue serology was also carried out for suspected cases to rule out dengue fever. All patients were hospitalized for 3–14 days. Slide positive cases were provided antimalarial treatment as per the guidelines of the National Vector Borne Disease Control Programme of the Government of India,. Patients aged >15, and < 70 yr were considered, and amongst them only the cases of severe malaria, having asexual form of Plasmodium in the blood in smear examinations were included in the study. The diagnosis of severe malaria was done as per the WHO guidelines. Patients who refused to give the written consent or had other concurrent illness or pre-existing diseases like hypertension, heart related diseases, diabetes mellitus and other chronically ill patients were not included in the study. The patients with ECG abnormalities and those without were used as independent variables. The independent student t-test was used to compare various attributes. Probability (p-value) analysis was performed with the statistical package for the social sciences (SPSS). A probability value of p<0.05 was considered statistically significant. During the study period, a total of 360 cases were diagnosed as malaria, and admitted in the various units of medicine. Amongst them, 27 cases were recorded as severe malaria (18 males and 9 females). Out of the 27 cases, 24 were of P. falciparum, one was of P. vivax and two were mixed infections [Table 1]. Initially, most of the patients presented with dyspnea, tachypnea, sinus tachycardia, pallor and tender hepatomegaly. All the patients were clinically examined and among them three had flow murmur and five had loud S1 on auscultation. No other abnormal sounds were heard/ observed. The true density of parasite may not be observed in many of the patients, as they had been treated by some local practitioners and quacks; additionally, sequestration of falciparum parasites may yield an artificially low parasite count on examination of peripheral blood smear. Manifestations of the severe malaria were: Severe anaemia (Hb <5 g/dL) in 37% patients, hepatitis in 29.6%, respiratory distress (difficulty in breathing) in 44.4%, cerebral dysfunctions in 74%, hypoglycemia in 3.7%, acute renal failure in 25.9%, thrombocytopenia in 51.8%, circulatory failure in 22% and multiorgan failure in 7.4% [Table 2]. Out of 27 cases of severe malaria, seven were found to be suffering from circulatory failure. Cardiovascular involvement was more common in P. falciparum malaria. 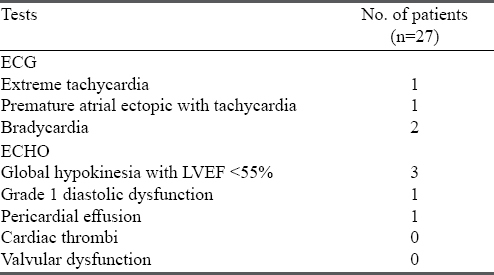 Patients of circulatory failure presented with tachycardia, tachypnea, decreased urine output, feeble pulse and hypotension [Table 2]. One out of the seven patients with circulatory failure died (mortality 14.2%). Bivalent, RDT was positive for P. vivax in one patient but the blood slide was negative. The patient came with the complain of high grade fever, tachycardia, shortness of breath and altered sensorium, but responded well on artesunate and was advised to take primaquine at a dose of 0.25 mg/kg body weight daily for 14 days under supervision. The most common finding in ECG was sinus tachycardia (HR 120–150) which was present in about 40% of the patients at the time of admission which settled down to the normal range within two to three days of treatment; among them 3.7% had premature atrial ectopic with tachycardia. About 7% of the patients showed sinus bradycardia (HR 40–60) [Figure 1]. The result was not significantly different (p < 0.05) between the patients with ECG abnormalities and those without. 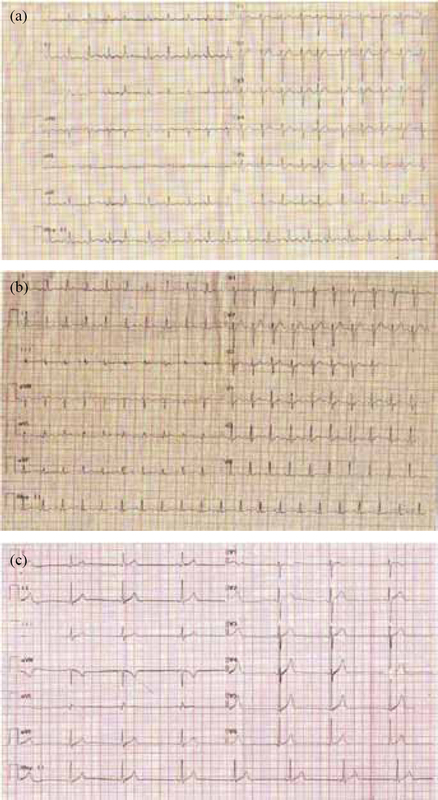 Figure 1: ECG of patient No. 8 showing premature atrial ectopic with tachycardia (a); patient No. 14 showing extreme tachycardia (b); and patient No. 20 showing sinus bradycardia (c). The significant echocardiographic findings were global hypokinesia with decreased left ventricular ejection fraction (< 55%) in 3 (11.1%), grade left ventricular diastolic dysfunction in one (3.7%), mild TR with mild PAH in one (3.7%), and mild pericardial effusion in one (3.7%) of the patients. 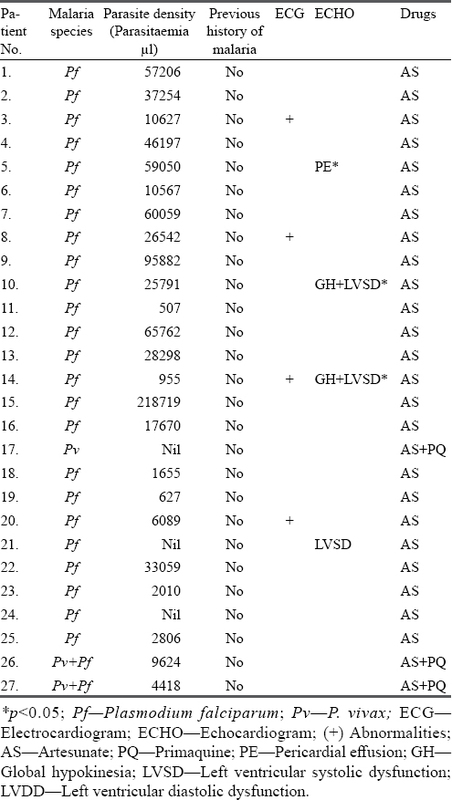 Other findings were within normal limits [Table 3]. In recent years, limited number of studies have focused on cardiac involvement in severe malaria, and most of them are case reports on P. falciparum,,,. Severe and fatal malaria continues to be a burden in endemic regions. Cardiac functions during and following the malaria infection has not been studied in tribal populations of Jharkhand. Therefore, present study was conducted to investigate the cardiovascular manifestation in severe malaria using 12 lead ECG and high-resolution transthoracic echocardiography. In the study, 27 patients were evaluated for acute and in particular long-term effects of malarial infection on the heart. The ECG results revealed sinus bradycardia (HR: 40–60) in 7% of cases, extreme tachycardia (HR: 120–150) in 3.7% of cases and premature atrial ectopic with tachycardia in 3.7% of patients (p < 0.05). The echocardiographic findings were global hypokinesia with decreased left ventricular ejection fraction (< 55%) in 11.1%, grade 1 left ventricular diastolic dysfunction in 3.7%, mild TR with mild PAH in 3.7% and mild pericardial effusion in 3.7% cases. Other findings were within normal limits. 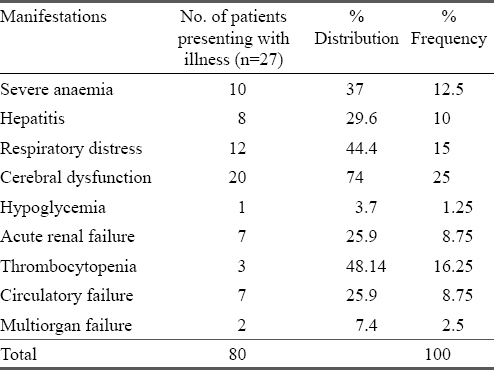 Other severe manifestations included cerebral dysfunctions in 74%, thrombocytopenia in 51.8%, respiratory distress in 44.4%, severe anaemia in 37%, acute renal failure in 25.9%, and hepatitis in 29.6%. The study corroborates the findings of other studies done previously,,,,,. Interestingly, one case of P. vivax infection associated with serious cardiovascular complications was also observed, which is rare. Earlier studies by Kaur et al in Delhi and Kochar et al, in Bikaner, India have shown vivax malaria to be associated with acute renal failure, thrombocytopenia, acute respiratory distress syndrome and hepatic dysfunction. It was observed, that two cases of mixed infection with severe malaria (Pv+Pf had clinical findings similar to that of severe P. falciparum mono infection. The research on impact of mixed infections on human health is controversial. Some researchers believe it to be beneficial, whereas others consider it to be detrimental,,,,,. The pathology for myocardial injury is due to direct toxic effects of etiological agent as well as excessive production of cytokines. Immune mediators have been identified to cause dysfunction. Major pathophysiological processes typical for P. falciparum malaria are the parasite adhesion to the endothelium resulting in the sequestration of parasitized and unparasitized red blood cells in peripheral small blood vessels, and the decreased deformability of RBCs resulting in impaired microcirculation and lactic acidosis. Parasite toxins or host immune mediators or both may have suppressive effects on myocardial functions. It has been shown that plasmodial toxin glycosylphosphatidylinositol augments apoptosis rate in cardiomyocyte culture. In addition to this, secondary infections, severe anaemia, hyperpyrexia, dehydration or fluid overload, metabolic acidosis, hypoxia and disseminated intravascular coagulation also contribute to the cardiovascular problems in malaria. Pre-existing cardiac decompensation may be complicated by malaria and even prove fatal for patients. Reported autopsies carried out in fatal malaria cases have revealed myocardial capillaries blocked with parasites and parasitized red blood cells, resulting in ischaemic cardiomyopathy,,,. It has been observed that cytoadherence exhibits a predilection for cerebral vessels (cerebral malaria), but it has been also observed in other organs, such as the heart. In addition, cardiac or circulatory failure in malaria might be due to toxic effects (myocarditis) by some yet unknown agent(s). More recent studies have indicated tumor necrosis factor (TNF) as a potential mediator. In summary, myocardial damage might be due to multifactorial pathogenesis, being probably the result of vascular obstruction, metabolic and humoral mechanism. The results indicated that cardiovascular instabilities are common in falciparum malaria; however, the involvement of vivax species in cardiovascular system was an interesting report. A multi-centric study is further required involving larger patient population with significant number of P. vivax cases for further confirmation. Hence, myocardial involvement should be considered as a potential complication in severe P. falciparum as well as P. vivax malaria cases. The authors are thankful to the Director, ICMR-National Institute of Malaria Research, New Delhi for providing necessary support to carry out the study. The authors are equally thankful to the Director, Rajendra Institute of Medical Sciences, Ranchi, India for providing necessary facilities and constant encouragement. The authors also thankful to Shri S.R. Shukla, NIMR, FU, Ranchi for his help in identification and counting of the malaria parasite density. The authors declare no conflict of interest associated with this study. IDVC Annual Report 2006–07. Science and Technology Project on Integrated Disease Vector Control. New Delhi: ICMR–National Institute of Malaria Research 2007; p. 1–96. Savargaonkar D, Shah N K, Das MK, Srivastava B, Valecha N. Plasmodium malariae infection: A case of missed diagnosis. J Vector Borne Dis 2014; 51(2): 149–51. Krishna S, Bharti PK, Chandel HS, Ahmad A, Kumar R, Singh PP, et al. Detection of mixed infections with Plasmodium spp. by PCR, India, 2014. Emerg Infect Dis 2015; 21(10): 1853–7. doi: 10.3201/eid2110.150678. Sachs J, Malaney P. The economic and social burden of malaria. Nature 2002; 415(672): 680–5. Mishra SK, Behera PK, Satpathi S. Cardiac involvement in malaria: An overlooked important complication. J Vector Borne Dis 2013; 50(3): 232–5. National framework for malaria elimination in India 2016–2030. Delhi: National Vector Borne Disease Control Programme 2016; p. 1–24. Guidelines for diagnosis and treatment of malaria in India, 2nd edn. New Delhi: ICMR–National Institute of Malaria Research 2011; p. 1–14. Mohapatra MK, Das SP. The nature and course of cardiac involvement during and after falciparum malaria. Pediatrics 2007; 120: 454–60. Severe falciparum malaria. World Health Organization, communicable diseases cluster. Trans R Soc Trop Med Hyg 2000; 94 (Suppl): S1–90. Snow RW, Guerra CA, Noor AM, Myint HY, Hay SI. The global distribution of clinical episodes of Plasmodium falciparum malaria. Nature 2005; 434: 214–7. Bethell DB, Phuong PT, Phuong CX, Nosten F, Waller D, Davis TM, et al. Electrocardiographic monitoring in severe falciparum malaria. Trans R Soc Trop Med Hyg 1996; 90(3): 266–9. Integrated Disease Vector Control Project: A Profile—Ranchi. New Delhi: ICMR-National Institute of Malaria Research 2007; p. 102–3. Kochar DK, Saxena V, Singh N, Kochar SK, Kumar SV, Das A. Plasmodium vivax malaria. Emerg Infect Dis 2005; 11: 132–4. Kochar DK, Das A, Kochar SK, Saxena V, Sirohi P, Garg S, et al. Severe Plasmodium vivax malaria: A report on serial cases from Bikaner in north-western India. Am J Trop Med Hyg 2009; 80(2): 194–8. Kochar DK, Tanwar GS, Khatri PC, Kochar SK, Sengar GS, Gupta A, et al. Clinical features of children hospitalized with malaria: A study from Bikaner, northwest India. Am J Trop Med Hyg 2010; 83(5): 981–9. Kochar DK, Das A, Kochar A, Middha S, Acharya J, Tanwar GS, et al. Thrombocytopenia in Plasmodium falciparum, Plasmodium vivax and mixed infection malaria: Study from Bikaner (northwestern India). Platelets 2010; 21(8): 623–7. Kochar DK, Shubhkaran, Thanvi I, Joshi A, Kumawat BL. Neurological complications of falciparum malaria. J Assoc Physicians India 1997; 45: 898–9. Elawad MEH, Jobaran JN, Duya A. Immunoglobulin therapy for severe thrombocytopenia complicating falciparum malaria. Trop Med Int Health 1999; 361(5): 526–8. Kaur D, Wasir V, Gulati S, Baga A. Unusual presentation of Plasmodium vivax malaria with severe thrombocytopenia and acute renal failure. J Trop Pediatr 2007; 53(3): 210–2. Barcus MJ, Basri H, Picarima H, Manyakori C, Sekartuti, Ely-azar I, et al. Demographic risk factors for severe and fatal vivax and falciparum malaria among hospital admission in north eastern Indonesian Papua. Am J Trop Med Hyg 2007; 77: 984–91. Genton B, D Acremont V, Rare L, Baea K, Reeder JC, Alpers MP, et al. Plasmodium vivax and mixed infections are associated with severe malaria in children: A prospective cohort study from Papua New Guinea. PloS Med 2008; 5: e127. Luxemburger C, Ricci F, Nosten F, Raimond D, Bathet S, White NJ. The epidemiology of severe malaria in an area of low transmission in Thailand. Trans R Soc Trop Med Hyg 1997; 91: 256–62. Price RN, Simpson JA, Nosten F, Luxemburger C, Hkirjaroen L, ter Kulie F, et al. Factors contributing to anaemia after uncomplicated falciparum malaria. Am. J Trop Med Hyg 2001; 65: 614–22. Joseph V, Varma M, Vidyasagar S, Mathew A. Comparison of the clinical profile and complications of mixed malaria infections of Plasmodium falciparum and Plasmodium vivax versus Plasmodium falciparum mono infection. Sultan Qaboos Univ Med J 2011; 11(3): 377–82. Mohapatra MK, Dash LK, Bariha PK, Karua PC. Profile of mixed species (Plasmodium vivax and P. falciparum) malaria in adults. J Assoc Physicians India 2012; 60: 20–4. Mac Pherson GG, Warrell MJ, White NJ, Looareesuwan S, Warrell DA. Human cerebral malaria. A quantitative ultrastructural analysis of parasitized erythrocyte sequestration. Am J Pathol 119: 385–401. Dudgeon LS, Clarke C. A contribution to the microscopically histology of malaria. Lancet II 1917; 190(4901): 153–6. Ewing J. Contributions to pathological anatomy of malarial fever. J Exp Med 1902; 6(2): 119–80. Sharma SN, Mohapatra AK, Machave YV Chronic falciparum cardiomyopathy. J Assoc Physicians India 1987; 35(3): 251–2. Warrell DA. Pathophysiology of severe falciparum malaria in man. Parasitology 1987; 94: 853–87. Clark A, Chaudhri G, Cowden WB. Roles of tumor necrosis factor in the illness and pathology of malaria. Trans R Soc Trop Med Hyg 1989; 83: 436–40.